The first rule for those who want to increase their reading rate to the maximum possible speed is practice. No one, not even our top instructors, can hope to maintain the highest levels of visual-vertical reading without regular "workouts." For example, Carol Romaniszak admits that her reading rate falls to 1,000—1,200 words per minute, with 80 percent comprehension, when she's not "in training." On the other hand, when she is in training, she works regularly at speeds of 2,000-3,000 words per minute with high levels of comprehension. But how do you push your speed limit up to these higher plateaus and keep it there? The first answer to this question is that you should read and read and read. And as you read it's essential to employ the techniques I've been describing in this book. Granted, they may seem strange at first. But believe me, the more you use them, the faster and more efficiently you'll find you can go through printed materials. There are also some drills that we've found extremely helpful in first pushing your speeds up to higher plateaus. In general, we classify these in three ways: push-down drills, push-up drills and power drills. 1. Pick a text that you've been assigned in one of your humanities or social studies classes. Place a watch or clock with a second hand nearby so that you can easily glance up from the text and note the time without significantly interrupting your reading pace. 4. Now, shifting to the S hand motion, read the same material in forty seconds. Again, you must reach the paper clip. 5. Using the S motion again, practice the same material in thirty seconds. 6. Next, switching to the question-mark hand motion, practice the same passage in twenty seconds. 7. With the question-mark motion again, practice through the same text in ten seconds. 8. Now, using a hand motion of your choice, begin reading in the text at the spot where you placed the paper clip and see how far you can get in this new material in one minute. Place a paper clip where you stop, and compute how many words you've read in the new material. Chances are, you'll find you're reading at a significantly faster rate than you were when you began the drill. Here's a variation on this drill which can add a gamelike dimension to study: Do the push-down drill by devoting ten minutes to each step instead of just one. Then, if you really feel ambitious, you might try the exercise in fifteen- or twenty-minute segments. Most likely, you'll find yourself flying through your assignments, with increased comprehension and efficiency. Push-up drill. The purpose of this exercise is mainly to increase your speed, rather than your comprehension. Using this technique, you learn, first, what it feels like to move at significantly faster reading rates. Second, you get a sense of the eye and hand motions necessary to enable you to read quickly. Once you've developed these skills and become familiar with the process of faster movement, you can expect higher comprehension levels to follow. 1. Using the underlining hand motion, read for one minute in a school text, and place a paper clip at the spot where you stop reading. Again, be sure to have a watch with a second hand near your field of vision so that you can easily keep track of the time. Count the number of words you've covered in this minute. This figure is the number of words per minute at which you're currently reading. well into some new material within the one-minute time limit. Advance your paper clip to the spot in the text that reflects the new speed record you've achieved. 3. Switch to the S hand motion, and reread again at an even faster rate, beginning at your original starting point in the text. As in the second step, place your paper clip at the new, more advanced spot in the text where you've stopped. 4. Now count the pages from the place where you started reading, to the spot where you last placed your paper clip. Next, count off the same number of pages into new material in the text and put a second paper clip at that point. In other words, the second paper clip should mark a point at double the number of pages that you've been able to read so far. 5. Using the S hand motion, practice for one minute at a pace that will take you to the second paper clip. You must reach that second clip, even though you most likely won't understand much of what you're trying to read. But still, allow your eyes to move over all the words on each page, and pick up as much as you can. Remember, your goal now is speed, not comprehension. If you're like most of our other students, you can expect a comprehension rate of only about 10-20 percent at this point. 6. Now, you're ready for some real supersonic mental soaring. Count off a segment of pages beyond your second paper clip equal to the segment before the first clip. Place a third paper clip at this point. In other words, you'll now have three clips in the text at equal distances from one another. 7. Using the S hand motion, practice for one minute, beginning at your original starting point in the text. Again, you must reach the final, third clip in this one minute. As in the fifth step, your comprehension of the newest material will be low, this time probably less than 10 percent. But when you finish this step, you will have tripled your speed over what you achieved in reaching the first paper clip. 8. Finally, it's time to see what this push-up drill, which has been primarily designed to stretch your speed capabilities, has done for your overall reading ability. Using a motion of your choice read for one minute in new material in the text which lies just beyond your third and final paper clip. Move along at a pace that seems fast, but still allows you to pick up the general concepts, thought patterns and significant details in the text. Now, compute your words per minute in this new material. You should find that you are reading considerably faster than you were when you began the exercise. A variation on this drill: Instead of limiting your time segments to one minute, increase them to ten minutes each. As in the push-down drill, this approach with homework assignments can inject a gamelike quality into studying and should enhance speed and efficiency in completing homework. Power drill. This exercise is intended mainly to build up your ability to comprehend and recall what you've read. 1. Choose an assigned text from one of your classes, make sure you have a pencil and some paper handy and place a watch or clock with a second hand near your line of vision. 2. Using the question-mark hand motion, move quickly through the text for one minute at a preview rate (about four seconds per page). 3. Close the book and for another minute, recall everything you've previewed. Jot down what you remember on your paper on a recall pattern. 4. Using the S hand motion, read as quickly as you can for one minute, beginning at the point in the text where you started your preview. Don't worry if you don't pick up everything, or even most things, in the text at this point. Now you're trying for speed as much as for comprehension. Keep in mind that it's highly unlikely that you'll get as far with this reading as you did with the preview. 5. Close the book and for one minute recall all that you've read. Add those recollections to your recall pattern. 6. Using the S motion again, reread for one and a half minutes from your starting point. This time move at a somewhat slower pace that will allow you to pick up more of the ideas and details in the text. But you should still be pushing yourself to the limit, concentrating on speed as well as on comprehension. 7. Close the book, recall all you can for one minute, and add what you remember to the recall pattern. 8. Using the S motion once more, reread again from the beginning, this time for two minutes. Your pace now should be one that will allow you to pick up the details you need for your normal study purposes. 9. When you're finished, put the book aside again and spend another minute recalling what you've read. Include this additional material on your recall pattern. 10. Finally, compute the word-per-minute rate of your final, two-minute reading in the ninth step. That figure will represent how fast you were reading with full comprehension. A variation on the power drill: Increase the preview and reading time segments by ten times their original values. In other words, the preview in the second step would take ten minutes instead of one minute; the first reading in the fourth step would take ten minutes instead of one; and so forth. Your recall times should stay about the same as they were in the original exercise, though you can lengthen them by as much as an extra minute if you like. Fast and efficient reading and study are possible for everyone, but the maximum rates—and the most powerful study tools—will always be reserved for those who are willing to drill and practice. As a general rule, the exercises I've described above are most useful for those who haven't yet reached their maximum speed, or for those who are out of practice and need a refresher. Students who have moved up to the higher speeds— more than 1,500 words per minute with at least 70-80 percent comprehension—can usually stay there simply by reading and studying regularly, while using the Mental Soaring techniques I've already described. In fact, many people find that if they read for even an hour a day using these methods, they steadily increase their speeds automatically, with high comprehension. But in the last analysis, where are all these study guidelines and speed-enhancing techniques taking us? For a student, of course, the bottom line is the final examination. So our last major topic must focus on how the skills you've been acquiring so far can be applied in a testing situation. 1. Reading speeds higher than about 1,200 words per minute can be achieved only with a visual-vertical approach. 2. 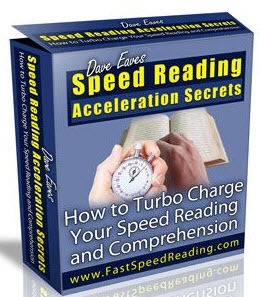 The overview and postview are essential prerequisites to achieve top reading speeds. 3. Practice with push-down, push-up and power drills is necessary for reaching the highest speeds and rates of comprehension.